The best word to describe Japanese knotweed is tenacious. Native to Japan (of course) and also China, it was carried to Great Britain for use as a garden ornamental. From there to Canada, the United States and New Zealand, where it is now considered a rapidly expanding and invasive species. Japanese knotweed is an attractive plant that looks something like bamboo, but with broad leaves. Once planted, the rhizome (root) expands rapidly, pushing out any other plants in the vicinity. While horticulturists have declared war on this invasive, herbalists are celebrating. Those tenacious rhizomes contain potent herbs. In its native countries, Japanese knotweed has been used for centuries as an herbal supplement. Japanese knotweed is an excellent source of resveratrol, the chemical compound found in grapes–except Japanese knotweed contains high concentrations of trans-resveratrol, the active form of the compound most useful to the body. Japanese knotweed is quickly becoming the preferred source of resveratrol. Trans-resveratrol is the chemical form of resveratrol best absorbed and utilized by the body. While red grapes are high in resveratrol, it must be converted into trans-resveratrol in the body. Japanese knotweed contains mostly trans-resveratrol, making it the preferred source. Japanese knotweed extract standardized to 50% is half trans-resveratrol… so it doesn’t take very much Japanese knotweed to get lots of resveratrol! Japanese knotweed also supports a healthy immune system. * Considering that everyone is almost continually exposed to garden variety of threats to the immune system, having a healthy and functioning immune system is not a bad idea. Side effects are rare with low potential for toxicity. Japanese knotweed has been used in traditional forms for thousands of years and offers a high level of safety. Like many herbs, Japanese knotweed has mild blood thinning properties — consult your physician if you are taking prescription blood thinners before taking Japanese knotweed. 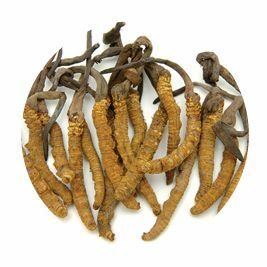 Cordyceps helps maintain healthy stress levels. * It balances hormones associated with stress, supports immune function and maintains healthy energy levels. * Click to learn more.